PESHAWAR, Pakistan — A suicide bombing at an election rally killed at least 13 people, including a politician, in northwestern Pakistan on Tuesday, police said, amid concerns about security ahead of national polls later this month. 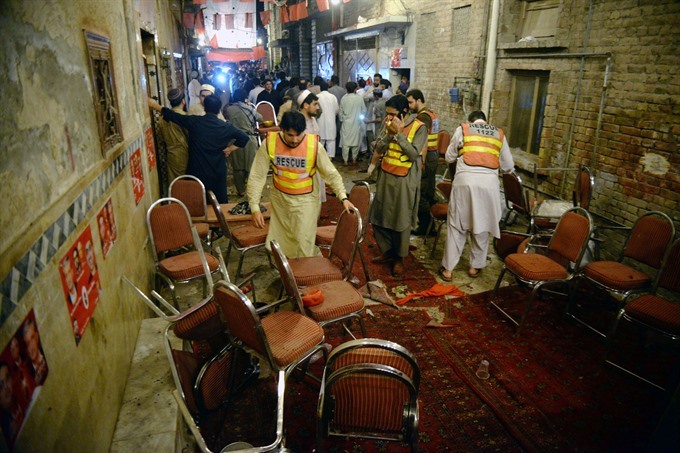 "The attack killed at least 13 people, including (Haroon) Bilour," Peshawar city police chief Qazi Jameel said. Haroon Bilour was one of the ANP’s election candidates and belonged to an influential political family in the Khyber-Pakhtunkhwa province, of which Peshawar is the capital. "According to our initial investigation, it was a suicide attack and Haroon Bilour... was the target," police official Shafqat Malik said. The city is considered a gateway to Pakistan’s troubled semi-autonomous tribal regions, where many militant groups -- including al Qaeda – operated until the government launched operations to oust them. Pakistan’s Election Commission has asked the military to help hold a "free and fair election" in the face of security threats. The ANP and its ally the Pakistan Peoples Party were unable to campaign for the last general election in 2013 because of threats and attacks on their events and supporters by Islamist militant groups like the Pakistani Taliban.